It is never easy to move any kind of data from one operating system to other. And when it comes to moving email data from Mac to Windows, the challenge takes a whole new form of a beast. One such task of email migration is Apple Mail to Outlook. The only way to perform it easily and efficiently is through a professional Apple Mail to Pst converter. And one of the best tools in that category is called “Mail Extractor Pro” that works seamlessly to move your emails, contacts, and calendar from Apple Mail to Pst or Windows Outlook. It features an easy to use graphical wizard that takes you through every step in order to accurately convert the data. The tool targets the Mbox files (for Apple Mail) and extracts all the data without any incongruities to Pst files (for Outlook). Its essence lies in the way it thoroughly sweeps the Mbox files and does not leave any component of the original data behind. You can expect every attachment, folder hierarchy, email headers, time and date stamps, embedded images, and every such element to be successfully converted to Pst files. In short, this tool creates exactly similar Pst files that in no way differs from its original source, Mbox files. Another great quality about “Mail Extractor Pro” is its support for all languages. Have you ever used any software program that seems good on paper but when you actually try it, you find out it is very incompetent and leaves out certain things because it doesn’t support it. That’s who many email migration tools are. They rarely support multi-languages and you can lose all your emails that are in languages other than English. Not “Mail Extractor Pro”. It supports even the double-byte characters, which can include languages such as Chinese and Korean. So, don’t worry about losing important data from your overseas clients. Moving on to some of its other primary features, it also supports batch conversion of Mbox files. That simply means you can select more than one Mbox file and convert them all to Pst in one go. This is a great time saver in case you have multiple Mbox files for conversion. “Mail Extractor Pro” is also fully capable of preserving the read or unread status of your emails. More than that, it allows you to convert and save read and unread emails in separate folders. Many tools can convert the unread mails to read mails, and keep them inside same folders, which can make it a nightmare to manage your emails in Outlook after conversion. 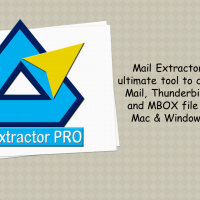 Not “Mail Extractor Pro”. So, what are you waiting for? Click here to try the free trial version of the tool. It lets you convert 10 items from each folder of Mbox files to Pst. It is one of the very rare Apple Mail to Pst converters that misses essentially no features necessary to make such a task successful. Moreover, you also get free 24×7 support for any of your technical issues, and all the updates will be free for lifetime. Never pay a single nickle extra after the initial purchase.